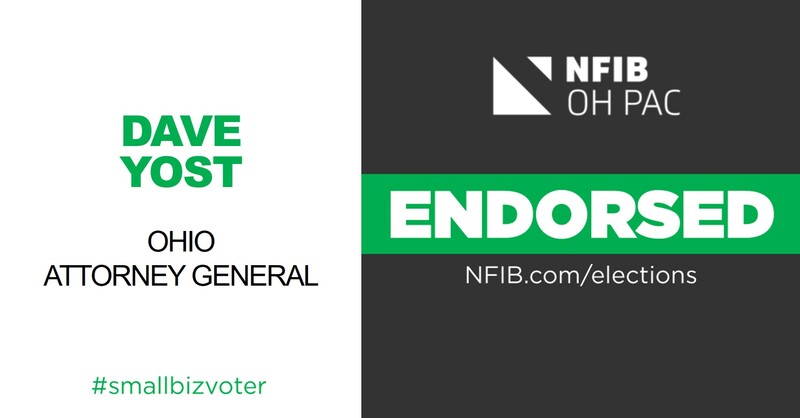 The NFIB OH PAC, the political action committee of NFIB in Ohio, has announced the endorsement of Dave Yost as the best candidate to represent the interests of small business owners in the race for Attorney General for the 2018 Ohio general election this coming November. Yost has been a strong advocate for ensuring Ohio’s tax dollars are used properly and protecting the state’s constitution from special interests seeking financial gain while serving as Ohio’s Auditor. He understands the need to establish an environment in which business owners can grow their companies and create jobs, helping to drive our economy forward. In determining the endorsement, the NFIB OH PAC thoroughly vetted the candidates for Attorney General through a member-driven process, including surveying members and personal interviews with the candidates. After completing the process, Dave Yost is the strongest choice for Ohio’s small business owners.